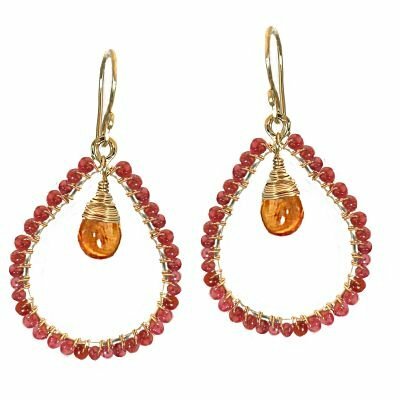 925 Sterling Silver Mandarin Garnet Hoop Earrings Item #: SRN188S Item Details: Retail $107.50 Metal Type sterling-silver Gemstones/Beads Mandarin Garnet Length or size 1 3/4 inches" Condition New Details sterling silver geniune stones. Calico Juno pieces have no pre-made or fabricated parts and all gemstones and beads are wrapped by hand, even the hoops and french wires are made by hand. They use precious and semi-precious gemstones, austrian crystals, freshwater pearls, and other stones are used in combination to create a wonderful palette of colors in all the original designs. Calico Juno Designs has been worn by many Celebraties and featured in all the fashions magazine. Second Glance Fashions: Get Noticed... the First Time…Every Time! Thank you for visiting Second Glance Fashions. Every woman has a deep down need to feel beautiful. Your self esteem is directly tied to it. When you put on a new outfit, get a new hair style, try on a new makeup brand or fragrance then look in the mirror… that moment that you see how beautiful you are, you immediately radiate a confidence and security that gives you a peace and positive feeling about who you are. We understand…we help you bring out your genuine beauty. All our products are 100% authentic. We only deal with authorized dealers and outlet stores and therefore all our products are authentic. We sell last years styles, closeouts and overstock. That is why we can offer them at a great price. When you purchase from Second Glance Fashions, you are getting new brand name designer fashions for pennies on the dollar. Returns & Exchanges Shipping International Customers Payment Options Frequenlty Asked Questions Contact Us Return/Exchange Policy Unlike other sellers on eCRATER, we do offer a return policy. If you are unhappy with your purchase within 7 days of your order, you may return your item for a refund , Please email us for a Return Authorization along with the reason that the item is being returned. Please print out the RMA and include it with the item being returned. Sorry, we do not refund freight charges. We reserve the right, at our sole discretion to apply a 10% restocking fee under some circumstances. To reduce returns for improper fitment, please refer to the measurements listed on the item detail page before purchasing. If you have any questions regarding any item, please contact us before purchasing. Conditions for returns are as follows: Item must include Return Authorization documentation. Product must be in the original condition with tags attached. Products must not have been worn other than to try on for proper fitment. Item must not have been altered or cleaned. Item must not have been exposed to any first or second hand smoke. Returns that fail to meet these requirements will receive zero credit and the item will be donated to charity. Shipping United States $0.00 Priority Mail $0.00 for additional items Canada $6.00 Priority Mail $2.00for additional items International $6.00 Priority Mail $2.00 for additional items *All Priority Mail includes a tracking number and delivery confirmation International Customers To our excellent international customers in Spain : Gracias; France : Merci; China : Xie-xie; Italy : Grazie; Portugal : Obrigado; Russia : Spasiba; Sweden : Tack; Malaysia : Terima kasih; Indonesia : Terima Kasih; Germany : Danke; Norway : Takk; Denmark : Tak; Japan : Arigato.To all countries….We thank you for your business! Customs Forms, Duties, and Import Fees Second Glance Fashions is pleased to offer our products internationally. As an established and growing company, we must adhere to the principles and laws regarding customs forms. All international orders will be declared as “other” on the Customs form. We have had many requests asking us to indicate a purchase as “gift”. Please understand that we cannot accommodate such requests. We sympathize with our international customers for the additional cost for duties, taxes, import fees, brokerage fees or tariff’s that you must bear, however all fees beyond the price of the item plus shipping and handling charges are the responsibility of the buyer. Customs policies and charges vary widely from country to country so please contact your local customs office if you need additional information How is my order being shipped? We ship primarily USPS Priority shipping with delivery confirmation. If you would like to have your order shipped Fed Ex or UPS, please email us for a freight quote if. We do not ship orders USPS First Class. How long will it take for me to get my item? Domestic: Orders placed and paid for by 12:00 noon Pacific Standard Time will ship within 1 business day. Orders typically will be delivered with 2 to 3 business days. International: Orders placed and paid for by 12:00 noon Pacific Standard Time will ship within 1 business day. Orders typically will be delivered with 10 to 14 business days, however due to possible customs delays, we can not guarantee international transit times. Payment Options After winning an item in product or completing a Buy It Now purchase, you have two check-out options: Check-Out Now! Click the Pay Now button at the top of this listing to immediately proceed with our checkout and payment process. Please note that the Pay Now button is ONLY available after winning an product or completing a Buy It Now purchase. Check-Out Later If you do not choose to Check-Out now, you will be notified by eCRATER via e-mail that you are the winning buyder. There is no need to contact us to arrange payment. We will automatically send you an e-mail within three hours of an product closing. Our message will contain a link to our simple and secure checkout system, where you will be able to quickly and conveniently pay for your purchase. I want to buy on other items that are closing in a few days, can I keep shopping? You may continue purchasing additional items from our products or eCRATER store. You have 7 days from the end of the first purchase to add additional items to your order. Make sure all of your products have ended prior to checking out. All of your purchases will be consolidated into one checkout! What forms of payment do you accept? We gladly accept Visa, MasterCard, and PayPal Sales Tax We are located in California and are required by State law to collect sales tax on items shipped to addresses in CA. Do you have a retail store so I can try on garments before purchasing? Second Glance Fashions is able to pass on huge savings to you by keeping our overhead and costs down. We do not have a retail store and cannot accommodate customers at our facility. Can I pick up my product to save freight charges? We are unable to accommodate customers at our facility and must ship your order… sorry, no will calls. Frequently Asked Questions Are your name brand items authentic? Yes! We buy our name brand designer fashions from major nationally known department stores and guarantee that they are 100% authentic. I don’t see my size or color listed, when will you get an item in my size? We process truckloads of product every day. Bookmark our website to check back daily for updated inventory. Will it fit me? Tag sizes are somewhat irrelevant because they vary drastically from designer to designer and thus are highly unreliable. For instance a Jones New York size 8 dress will have different measurements than a BCBG size 8 dress. We take extreme care while measuring each and every garment for you. All measurements are taken with the garment lying naturally on a flat surface without being stretched. We clearly state the exact measurements of the item for your reference. Many of our customers have told us that they will go to the department store and try on the exact garment or designer for fitment, then purchase it from us. If you have the time to do that…great! Otherwise please check with the measurements that we provide; the tape measure is highly reliable! If you have any questions on how to determine your size, please refer to our sizing chart. Why is there a hand written price tag on the garment, is this used? No.